Summary: We present two cases of dural arteriovenous fistula of the cavernous sinus with venous congestion of the brain stem. Both cases were detected by MR imaging and showed significant improvement on MR images after transvenous embolization. Dural arteriovenous fistulas (DAVFs) of the cavernous sinus are abnormal communications between the dural branches of the internal, or external carotid arteries, or both, and the cavernous sinus. These abnormalities can cause chemosis, proptosis, and bruit (1) and, rarely, infarction or hemorrhage. We describe two cases of DAVF of the cavernous sinus with venous congestion of the brain stem, an extremely rare complication. A 49-year-old man who fell after experiencing sudden vertigo received a mild bruise on his occiput. Left-sided exophthalmos and chemosis appeared the next day and he consulted an ophthalmologist, complaining of diplopia. Carotid-cavernous fistula was suspected, and brain MR imaging was performed at our hospital 1 week later. Axial T2-weighted images obtained with a fast spin-echo sequence (4000/98/1 [TR/TE/excitations]) showed a dilated left superior ophthalmic vein and hyperintensity of the brain stem, mainly on the left side (Fig 1A). Contrast-enhanced T1-weighted images (600/12/2) showed enhancement on the left side of the brain stem, which was clearly demarcated by the pontine raphe (Fig 1B). The patient was admitted to the hospital 3 weeks after symptom onset, and cerebral angiography, MR imaging, and CT were performed. 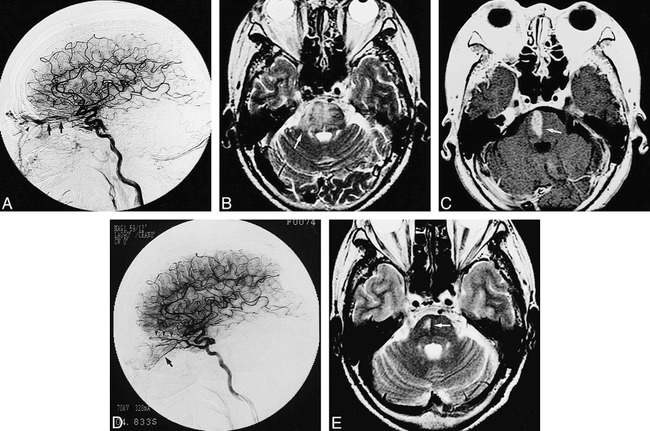 Cerebral angiography showed a left-sided DAVF of the cavernous sinus supplied by bilateral internal carotid arteries with venous drainage into the left superior petrosal sinus and the superior and inferior ophthalmic vein (Fig 1C). Cortical venous reflux was observed via the petrosal vein; the lateral half of the left superior petrosal sinus was not opacified. The venous phase of the left vertebral arteriography showed no opacification of the left superior petrosal sinus or left petrosal vein. Case 1: 49-year-old man with exophthalmos, chemosis, and diplopia. A and B, Initial MR imaging. A, Axial noncontrast T2-weighted image with a fast spin-echo sequence (4000/98/1) shows slight enlargement and hyperintensity of the left cerebellar hemisphere and left side of the pons (arrows). Left-sided exophthalmos is demonstrated. B, Axial contrast-enhanced T1-weighted image (600/12/2) shows contrast enhancement in the left cerebellar hemisphere and on the left side of the pons, demarcated by the pontine raphe (arrows). C, Cerebral angiogram 3 weeks after onset. Late arterial phase of the right internal carotid arteriogram, lateral projection, shows a left-sided DAVF of the cavernous sinus with venous drainage into the left superior petrosal sinus (solid arrow), left superior ophthalmic vein (open arrow), and left inferior ophthalmic vein (open arrowheads). Cortical venous reflux (solid arrowheads) is seen via the left petrosal vein, and the lateral half of the left superior petrosal sinus is not opacified. D, Axial T2-weighted MR image obtained with a fast spin-echo sequence (4000/98/1) 3 months after embolization shows significant improvement of the pontine lesion (arrow) and left exophthalmos. An MR examination revealed a brain stem lesion on T2-weighted images and on contrast-enhanced T1-weighted images. The lesion was mildly hypodense on a noncontrast CT scan, and showed only faint enhancement on a contrast-enhanced CT study. No neurologic deficit was observed except for ophthalmoplegia that was associated with diabetes mellitus, which was subsequently treated. 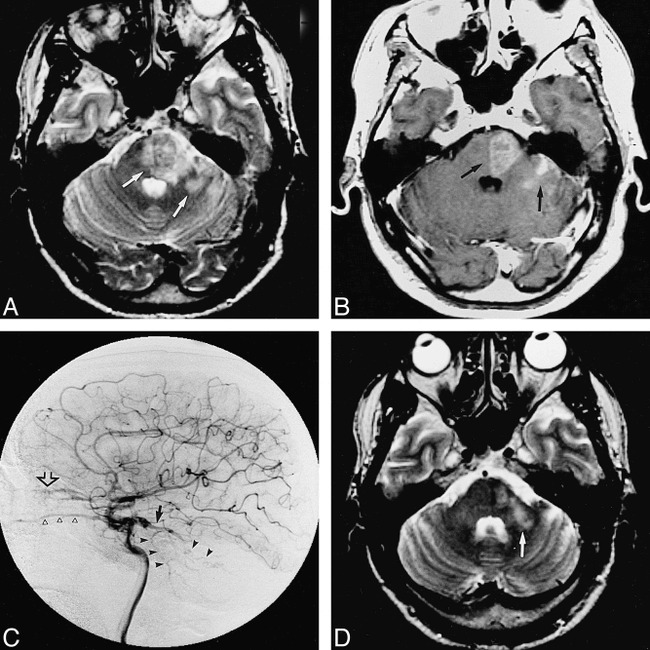 Transvenous embolization was attempted via the left inferior petrosal sinus, which was not opacified on the cerebral angiogram, but the catheter could not be inserted. Instead, the catheter was inserted into the right cavernous sinus via the right inferior petrosal sinus, but this approach also failed. Transvenous embolization was finally accomplished via the left superior ophthalmic vein using portable digital subtraction angiography under general anesthesia in the operating room 3 days later. The left cavernous sinus was embolized with interlocking detachable coils (IDCs) and fibered platinum coils (FPCs) (Target Therapeutics, Fremont, CA). A total of 17 coils (four IDC-18 2-mm × 4-cm coils, four IDC-18 3-mm × 6-cm coils, two IDC-18 3-mm × 10-cm coils, two IDC-18 4-mm × 8-cm coils, followed by five FPC straight 5-mm coils) were placed into the fistulous zone of the left cavernous sinus. Immediately after embolization, angiography showed that the DAVF had disappeared. Ophthalmopathy improved dramatically. A follow-up study was performed 3 months after embolization. Cerebral angiography indicated no recurrence of the DAVF, and MR imaging showed significant improvement of the brain stem lesion on both T2-weighted images (Fig 1D) and contrast-enhanced T1-weighted images. A 62-year-old woman was admitted to our hospital complaining of loss of visual acuity, right-sided chemosis, and exophthalmos. Axial T2-weighted MR images obtained with a fast spin-echo sequence (4000/98/2) showed a dilated superior ophthalmic vein bilaterally and abnormal flow voids in the right cavernous sinus. Cerebral angiography showed a right-sided DAVF of the cavernous sinus supplied by the dural branches of the internal and external carotid arteries bilaterally, with venous drainage into both superior ophthalmic veins (Fig 2A). The patient was initially treated by intermittent compression of the common carotid artery and jugular vein. Right-sided chemosis was not improved, and follow-up MR imaging was performed 25 days after therapy had begun. Hyperintensity of the right side of the brain stem appeared on axial T2-weighted images (5000/105/2) (Fig 2B). The lesion was mildly hypointense on T1-weighted images (500/9/2). On contrast-enhanced T1-weighted images (500/9/2), marked enhancement was noted on the right side of the brain stem, which was clearly demarcated by the pontine raphe (Fig 2C). Transvenous embolization was subsequently performed via the left inferior petrosal sinus with IDCs and FPCs. Case 2: 62-year-old woman with loss of visual acuity, right-sided chemosis, and exophthalmos. A, On admission, left internal carotid arteriogram in a lateral projection shows a DAVF of the cavernous sinus with venous drainage into the right (arrows) and left (arrowhead) superior ophthalmic vein. B, Axial T2-weighted MR image with a fast spin-echo sequence (5000/105/2) obtained after intermittent compression of the common carotid artery and jugular vein shows diffuse hyperintensity of the pons (arrow). C, Contrast-enhanced axial T1-weighted image (500/9/2) shows enhancement on the pons, demarcated by the pontine raphe (arrow). D, Left internal carotid arteriogram in a lateral projection just before embolization shows a DAVF with stagnant blood flow into the right superior (arrowheads) and inferior (arrow) ophthalmic vein. The right superior ophthalmic vein is obliterated at the extraconic portion. Posterior venous drainage via the right superior petrosal sinus is not demonstrated. E, Axial T2-weighted image obtained with a fast spin-echo sequence (3000/98/2) approximately 1 month after embolization shows significant improvement of the pontine lesion (arrow). Cerebral angiography before embolization showed a marked decrease in the number of feeding pedicles and obliteration of the right superior ophthalmic vein at the extraconic portion (Fig 2D). Venous drainage into the left cavernous sinus was also obliterated. A right-sided DAVF was supplied by the left internal carotid artery and drained into the stagnant right superior and inferior ophthalmic vein. No opacification of cortical venous reflux was observed in the posterior fossa. A total of four coils (three IDC-18 2-mm × 4-cm coils followed by an FPC Vortx 2–3 mm × 22-mm coil) were placed into the fistulous zone of the right cavernous sinus. Cerebral angiography immediately after embolization showed that the DAVF had disappeared. Ophthalmopathy gradually improved. MR imaging approximately 1 month after embolization showed significant improvement of the brain stem lesion on both T2-weighted images (Fig 2E) and contrast-enhanced T1-weighted images. DAVFs of the cavernous sinus occur most often in elderly women (1) and are considered to be acquired lesions (2). The clinical presentation is closely related to the pattern of venous drainage of DAVFs (3), and its classical triad of symptoms are proptosis, chemosis, and a bruit caused by anterior venous drainage into the superior or inferior ophthalmic vein. Spontaneous remissions sometimes occur and are regarded as benign (4). Halbach et al (5) reported only one case of cortical venous drainage into the sylvian vein that resulted in severe headaches and papilledema in 28 cases of DAVF of the cavernous sinus. Uchino et al (6) reported two cases of DAVFs with convergence of venous drainage into the basal vein of Rosenthal or cortical veins of the posterior fossa, resulting in pontine venous congestion. In the present cases, cerebral angiography in case 1 revealed cortical venous reflux via the left petrosal vein. Thrombosis presumably prevented opacification of the lateral segment of the superior petrosal sinus and accelerated the cortical venous reflux. In case 2, venous congestion appeared after intermittent compression of the common carotid artery and jugular vein. Cerebral angiography after therapy showed a decrease in the number of feeding pedicles and obliteration of the venous outlets. We assumed that obliteration of the venous outlets increased the flow from the DAVF into the veins of the posterior fossa. Because no neurologic signs or symptoms were observed in either patient, except for ophthalmopathy, clinical diagnosis was difficult. MR imaging depicted complicated brain stem lesions in both cases. T2-weighted images showed enlargement and hyperintensity of the brain stem, mainly on the same side on which the DAVFs were located. The lesion was mildly hypointense on noncontrast T1-weighted images, and showed marked enhancement, demarcated by the pontine raphe, on contrast-enhanced T1-weighted images. This finding is in accordance with previously reported findings of DAVFs with venous congestion (6, 7). We believe that the hyperintensity of the brain stem on T2-weighted images reflects venous hypertension and passive congestion of the brain. The brain stem lesion in case 1 was hypodense on the noncontrast CT scan and showed faint enhancement on the contrast-enhanced scan. These findings improved after embolization, which was evidence of a reversible change (8). There are several methods of treating DAVFs of the cavernous sinus, including intermittent compression of the common carotid artery and jugular vein, transarterial embolization of the external carotid artery, and transvenous embolization using microcoils and radiotherapy (5). In our cases, urgent and complete obliteration of the fistula was required, because venous congestion may have led to venous infarction or hemorrhage (7). When catheterization is possible, transvenous embolization has a high occlusion rate (9, 10). Therefore, we selected transvenous embolization and obtained complete obliteration of the fistulas in the both cases. 1 Address reprint requests to Satoshi Takahashi, MD, Department of Radiology, Akita University School of Medicine, 1–1–1 Hondo, Akita 010-8543, Japan.